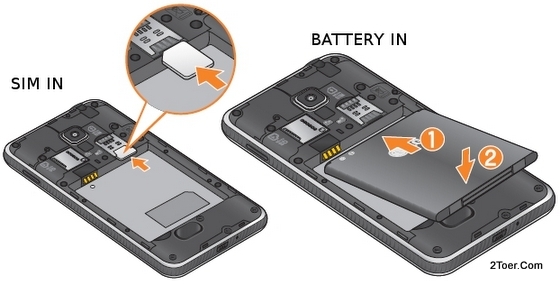 You can start on opening the rear casing of LG Escape from the bottom side of the device. Use your fingertip on this bottom-opening gap (cutout; inserting your fingertip in this location) the press, and lift the bottom part of the cover up until it's partly removed. Continue to lift the sides of remaining cover with your fingernail or tip of your finger until the casing completely removed. For the locations of the SIM card slot and microSD memory card slot, you can easily find after you finished on opening the back cover case of LG Escape. Under (right side) the 5MP rear camera is the slot for SI, nad on for the microSD slot (maximum 32GB) in on the left side. See the image above for sure: including the battery and its compartment are also pictured. Close back the rear cover casing. Align the camera hole with the rear camera body, then press the sides down gently with your fingertip. If the sides didn't leave any gap that means the cover perfectly attached to LG Escpae P870. Another way to make sure the cover well-attached, when you press the casing down again the body of the phone, make sure it clicks. With gold-colored contacts area is facing downward, slide and push the SIM card into the card slot with your fingertip. If the card still not reach the end of the slot, use your "back of fingernail" to push the SIM until the SIM is finally successful inside the SIM card slot. When you wanna try to insert the microSD card to its memory slot, remember that the gold-contacts always facing down (microSD logo facing up), then slide and push the card into its slot with your fingernail / fingertip. Make sure the notch of the microSD card align properly with the mouth of the slot. Done. On the installing battery: align the metal-contacts side of the Li-ion battery with the gold-connector of its compartment, make sure the LG logo is facing upwards, then slide and press the battery down to its place. Whenever you heard click sound, that means the battery well-assembled on the compartment. There are two ways on facing the frozen screen on your LG Escape P870. If the touchscreen stop responding occasionally, try to remove unnecessary file, data, games from the device to make a little more storage in internal memory. Or if it just sometime not too often, try to force restart or reboot: Press the power for about 11 seconds, then after the phone shutting down (force turn off), press once again the power button for about 3-5 seconds to turn it on. This is the hardware way on doing the Hard Reset / Factory Reset: Turn the phone off > Press and Hold Volume Down Key and Power key at once > Release all keys whenever the device vibrates > Tap Back Key then Home Key repeately > Stop tapping whenever the Android Robot shown up > Reset process is on going > Wait till the resetting phone is done. Otherwise, Go to Settings > Backup & Restor > Facotyr data reset > Reset phone > Follow the rest. Warning! Backup, backup your data before doing Hard Reset on LG Escape P870. All your data will be lost!